Restore health, happiness & harmony to people & planet! 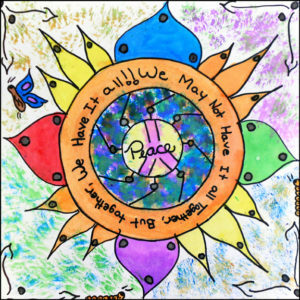 Explore and celebrate concepts of peace, unity and diversity; deepen connections to self, others and the world around us; strengthen relationships and community; have fun while making meditative art! 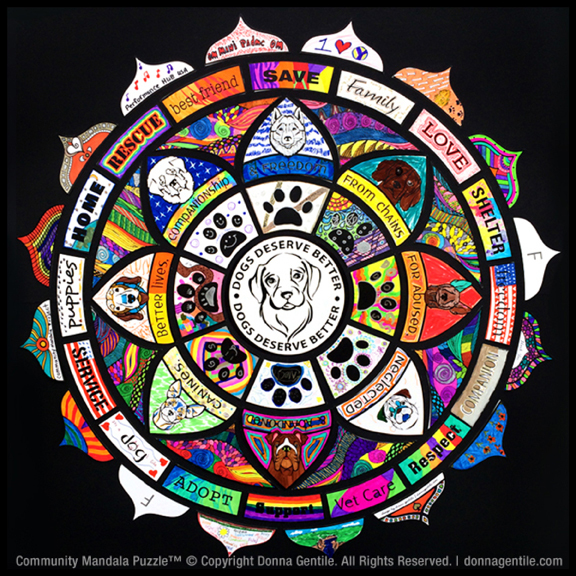 The Unity & Diversity Mandala is a meaningful and fun way to experience mindfulness and the meditative art of mandala-making. It’s ideal for individuals and groups seeking positive and creative ways to connect, promote peace, celebrate diversity and improve a sense of harmony, wholeness and well-being while having fun! 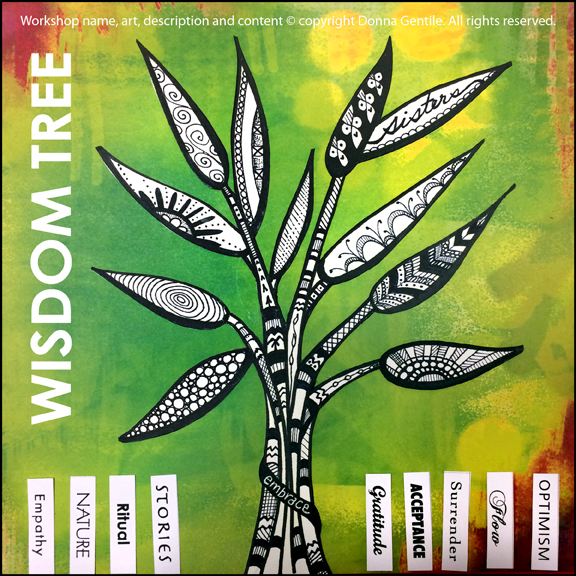 Workshop is 2 hours and is accompanied by inspirational readings, texts, instruction, relaxing music and a slide show. No experience necessary. 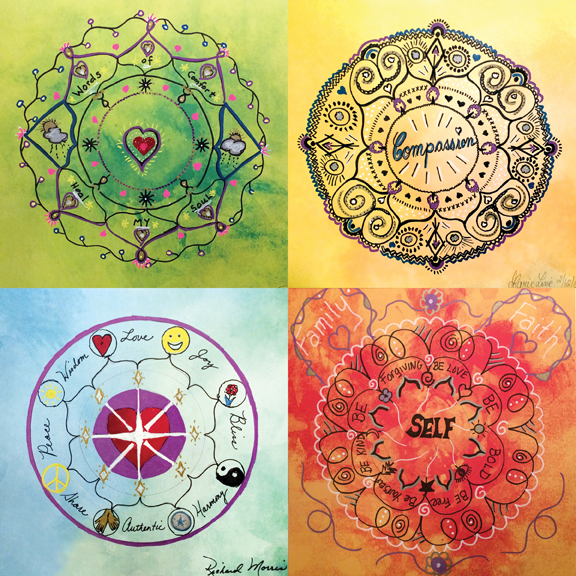 Mandala workshops are fun, relaxing visual meditations that can restore harmony, balance and a sense of wholeness and well-being to the individual, which in turn can improve and strengthen the wellness and productivity of relationships, teams, groups and ultimately, your business, family or community! Participants leave with a meaningful mandala creation, a powerful unifying experience, and a new practice that can serve as a reminder to incorporate mindfulness into a daily routine in order to restore the 3 H’s (health, happiness & harmony) to people and planet. Contact us for inquiries and a quote. 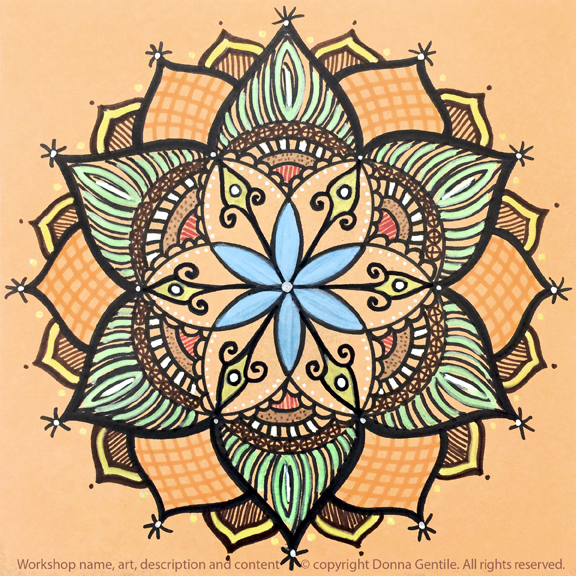 *Featured artwork by participant of Mandala Workshop hosted by Toivo of Advocacy Unlimited (Hartford, CT). Workshop content © Donna Gentile. All rights reserved. 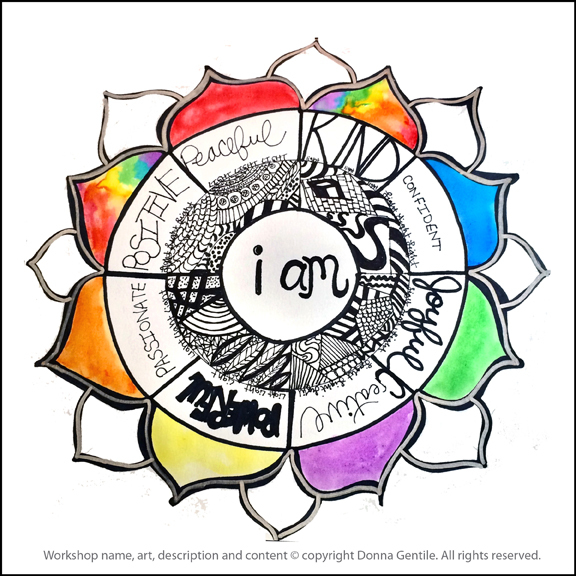 Donna Gentile, artist, educator and founder of Community Mandala Project uses art and the power of stories to inspire, empower and transform people, businesses and communities. 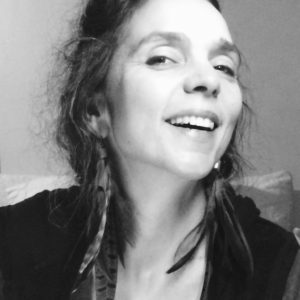 Mandalas and other meditative art helped her heal after domestic violence by giving her a way to work through difficult emotions, push past limiting beliefs, take back her power, tell her new story, strengthen resilience and thrive. Gentile has worked with incredible organizations since 2004 such as The Bushnell of Hartford, Cancer Care, Catalyst Foundation, Connecticut Women’s Consortium, Department of Mental Health & Addiction Services (DMHAS), Farmington Valley Health District’s veteran’s initiative, Toivo by Advocacy Unlimited, Cut Out Cancer, AIM for a Better Tomorrow, senior centers, assisted living facilities, schools and more. Donna is also a graphic, brand and web designer, musician and mother.